Role of Glutathione. Low Glutathione- Causes and Solutions. Glutathione (GSH) is an organic chemical that is found in plants and animals. It is a tripeptide with a gamma peptide linkage between the amine group of cysteine (which is attached by normal peptide linkage to a glycine) and the carboxyl group of the glutamate side-chain. It is an antioxidant, preventing damage to important cellular components caused by reactive oxygen species such as free radicals and peroxides. Thiol groups are reducing agents, existing at a concentration of approximately 5 mM in animal cells. Glutathione reduces disulfide bonds formed within cytoplasmic proteins to cysteines by serving as an electron donor. In the process, glutathione is converted to its oxidized form, glutathione disulfide (GSSG), also called L-(–)-glutathione. Once oxidized, glutathione can be reduced back by glutathione reductase, using NADPH as an electron donor. 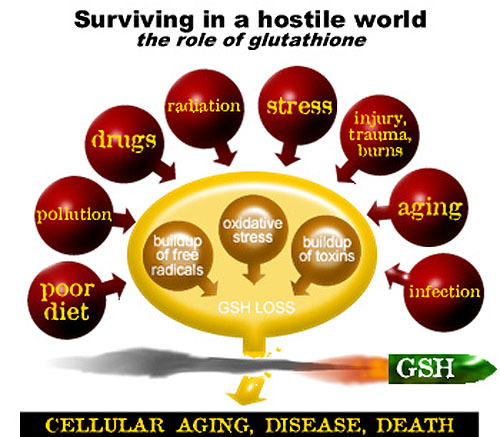 The ratio of reduced glutathione to oxidized glutathione within cells is often used as a measure of cellular toxicity. Antioxidants are substances that protect our cells from oxidation (by free radicals). Antioxidants are dietary substances including some nutrients such as beta carotene, vitamins C and E and selenium, that can prevent damage to your body cells or repair damage that has been done. 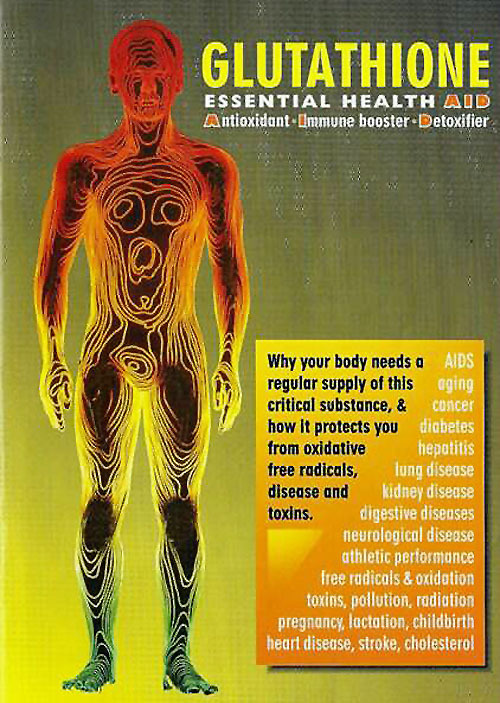 Another, glutathione (the "master antioxidant"), is manufactured by our own bodies. Antioxidants work by significantly slowing or preventing the oxidative -- or damage from oxygen -- process caused by free radicals that can lead to cell dysfunction and the onset of problems like heart disease and diabetes. Antioxidants also improve immune function and perhaps lower your risk for infection and cancer. In your body, the antioxidant process is similar to stopping an apple from browning. Once you cut an apple, it begins to brown, but if you dip it in orange juice, which contains vitamin C, it stays white. Antioxidants work by offering easy electron targets for free radicals. What are the free radicals? Molecules are composed of atoms bonded together, via the sharing of electrons. Generally, atoms exist in pairs, with each electron of the pair having an opposite spin to the other. When a molecule is split, two things can happen. First, the electrons can stay together. When this happens, we say the molecule has ionized. For example, table salt, which is Sodium Chloride (NaCl), ionizes into two charged ions, specifically a sodium ion and a chloride ion. In this case, the Chloride received the electron pair, and the Sodium lost it. The other thing that can happen is that the electron pair is split. This leaves a highly reactive atom (a free radical), seeking to steal an electron, which sets up a domino effect of electron stealing. Each time you are confronted by the threats in the outer circle of the diagram free radicals are released. The natural reserve of glutathione in the body breaks down under the assault. The effects of oxidative stress are so critical in fact that a new field of medical science has emerged, called 'Free Radical Biology' which studies the long list of diseases caused by it. Today it is known that antioxidants help diminish cell damage, slows the harmful effects of aging and lessens the threat of disease. Oxidative stress can be minimized by raising intracellular GSH levels. If the free radical is not neutralized by an antioxidant it can wreak all sorts of havoc in our bodies. Current research, for example, is pointing to the fact that it is not only the presence of fat in our bodies that leads to plaque formation on our arteries, but the oxidation of fat by free radicals. With cancer, the problem starts when free radicals chip away at the DNA of our cells, eventually causing mutations that lead to malignancies. The antioxidants provided by vitamins work because they can donate electrons to free radicals, thus neutralizing them. However, this makes the vitamin molecule unstable, and now it needs an electron. This is sort of like passing a very hot potato from person to person until someone finds a place to lay it down. In our bodies, that place is glutathione. The chemical equation gets fairly technical, but in the end glutathione donates an electron and becomes a stable molecule known as GSH. Glutathione can then be regenerated via an enzymatic pathway that involves lipoic acid. The details of the chemistry involved is beyond the scope of this page, but is well established in the scientific literature. Also well established is the fact that the glutathione antioxidant system is the most important system in our bodies when it comes to the destruction of reactive oxygen compounds (very potent free radicals). (Meister, 1994) Glutathione is often referred to as GSH. Glutathione is not an essential nutrient, since it can be synthesized in the body from the amino acids L-cysteine, L-glutamic acid, and glycine. The sulfhydryl (thiol) group (SH) of cysteine serves as a proton donor and is responsible for the biological activity of glutathione. Cysteine is the rate-limiting factor in cellular glutathione synthesis, since this amino acid is relatively rare in foodstuffs. ● First, gamma-glutamylcysteine is synthesized from L-glutamate and cysteine via the enzyme gamma-glutamylcysteine synthetase (glutamate cysteine ligase, GCL). This reaction is the rate-limiting step in glutathione synthesis. ● Second, glycine is added to the C-terminal of gamma-glutamylcysteine via the enzyme glutathione synthetase. Animal glutamate cysteine ligase (GCL) is a heterodimeric enzyme composed of a catalytic (GCLC) and modulatory (GCLM) subunit. GCLC constitutes all the enzymatic activity, whereas GCLM increases the catalytic efficiency of GCLC. Mice lacking GCLC (i.e., lacking all de novo GSH synthesis) die before birth. Mice lacking GCLM demonstrate no outward phenotype, but exhibit marked decrease in GSH and increased sensitivity to toxic insults. While all cells in the human body are capable of synthesizing glutathione, liver glutathione synthesis has been shown to be essential. Mice with genetically-induced loss of GCLC (i.e., GSH synthesis) only in the liver die within 1 month of birth. The plant glutamate cysteine ligase (GCL) is a redox-sensitive homodimeric enzyme, conserved in the plant kingdom. In an oxidizing environment, intermolecular disulfide bridges are formed and the enzyme switches to the dimeric active state. The midpoint potential of the critical cysteine pair is -318 mV. In addition to the redox-dependent control is the plant GCL enzyme feedback inhibited by GSH. GCL is exclusively located in plastids, and glutathione synthetase is dual-targeted to plastids and cytosol, thus are GSH and gamma-glutamylcysteine exported from the plastids. Both glutathione biosynthesis enzymes are essential in plants; knock-outs of GCL and GS are lethal to embryo and seedling. Glutathione exists in both reduced (GSH) and oxidized (GSSG) states. In the reduced state, the thiol group of cysteine is able to donate a reducing equivalent (H++ e−) to other unstable molecules, such as reactive oxygen species. In donating an electron, glutathione itself becomes reactive, but readily reacts with another reactive glutathione to form glutathione disulfide (GSSG). Such a reaction is probable due to the relatively high concentration of glutathione in cells (up to 5 mM in the liver). GSH can be regenerated from GSSG by the enzyme glutathione reductase (GSR): NADPH reduces FAD present in GSR to produce a transient FADH-anion. This anion then quickly breaks a disulfide bond (Cys58 - Cys63) and leads to Cys63's nucleophilically attacking the nearest sulfide unit in the GSSG molecule (promoted by His467), which creates a mixed disulfide bond (GS-Cys58) and a GS-anion. His467 of GSR then protonates the GS-anion to form the first GSH. Next, Cys63 nucleophilically attacks the sulfide of Cys58, releasing a GS-anion, which, in turn, picks up a solvent proton and is released from the enzyme, thereby creating the second GSH. So, for every GSSG and NADPH, two reduced GSH molecules are gained, which can again act as antioxidants scavenging reactive oxygen species in the cell. ● It is the major endogenous antioxidant produced by the cells, participating directly in the neutralization of free radicals and reactive oxygen compounds, as well as maintaining exogenous antioxidants such as vitamins C and E in their reduced (active) forms. ● It is used in metabolic and biochemical reactions such as DNA synthesis and repair, protein synthesis, prostaglandin synthesis, amino acid transport, and enzyme activation. Thus, every system in the body can be affected by the state of the glutathione system, especially the immune system, the nervous system, the gastrointestinal system and the lungs. ● It has a vital function in iron metabolism. Yeast cells depleted of or containing toxic levels of GSH show an intense iron starvation-like response and impairment of the activity of extra-mitochondrial ISC enzymes, followed by death. Why is Glutathione critical to health and even life?